MUNICH, Germany, August 2, 2011 (ENS) – Exposure to nanoparticles about one-thousandth the width of a human hair produces changes in heart rate and rhythm typical of heart disease, according to new research from a team of German scientists. Using a so-called Langendorff heart – an isolated rodent heart flushed with a nutrient solution in place of blood – scientists from the Helmholtz Zentrum München and the Technische Universitaet München have, for the first time, been able to show that nanoparticles have a clearly measurable effect on the heart. When exposed to a series of artificial nanoparticles commonly used in industry and medicine, the heart reacted to certain types of particles with an increased heart rate, cardiac arrhythmia and modified electrocardiogram values that are associated with heart disease. “The heart is especially good as a test object,” said Andreas Stampfl, first author of the study, reported in the journal “ACS Nano,” a publication of the American Chemical Society. “It has its own clock, the sinus node, and can therefore continue to work as an organ outside the body for several hours,” he said. Stampfl and his team used their heart model to test carbon black and titanium dioxide nanoparticles, as well as spark-generated carbon, which serves as a model for airborne pollutants stemming from diesel combustion. In addition, silicon dioxide, different Aerosil silicas used as thickening agents in cosmetics, and polystyrene were tested. Carbon black, spark-generated carbon, titanium dioxide and silicon dioxide led to an increase in the heart rate of up to 15 percent with altered electrocardiogram values that did not normalize, even after the nanoparticle exposure was ended. The Aerosil silicas and polystyrene did not show any effect on the heart function. Artificial nanoparticles are used in many industrial products. The relatively large surface area of titanium dioxide nanoparticles, for example, leads to a large refractive index that makes the substance appear brilliant white. It is often used in white coating paints or as a UV blocker in sunscreens. Carbon black is another widely used nanoparticle, mainly in car tires and plastics, with over eight million tons produced annually. The small size of these nanoparticles makes them well suited for use as dyes in printers and copying machines. According to Stampfl and Niessner, it is likely that the neurotransmitter noradrenaline is responsible for the increased heart rate brought on by nanoparticles. Noradrenaline is released by nerve endings in the inner wall of the heart. It increases the heart rate and also plays an important role in the central nervous system – a tip-off that nanoparticles might also have a damaging effect there. 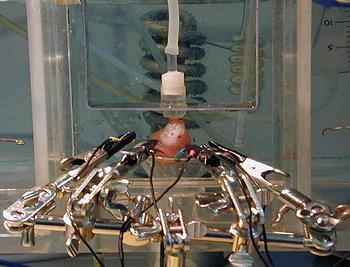 With their enhanced Langendorff heart, the researchers have now for the first time developed a measurement setup that can be used to analyze the effects of nanoparticles on a complete, intact organ without being influenced by the reactions of other organs. This new heart model may prove to be particularly useful in medical research where artificial nanoparticles are increasingly deployed as transportation vehicles for active agents to a destination in the human body such as a tumor. Most of the initial prototypes of such “nano containers” are carbon or silicate based. So far, the effect of these substances on the human body is largely unknown. The researchers say their new heart model could serve as a test organ to help select those particles types that do not affect the heart in a negative way. Nano-size pollutants from vehicles can lead to plaque buildup in the arteries, putting people at risk of cardiovascular problems, American researchers said in a study published in 2008 in “Circulation Research,” a journal of the American Heart Association. The pollutants may cause arteries to harden by impairing the protective qualities of so-called good cholesterol, said Jesus Araujo, the study’s lead author and director of environmental cardiology at University of California, Los Angeles. Araujo said people with a history of heart disease should be especially cautious about being exposed to high levels of pollution. The U.S. Environmental Protection Agency does not regulate nanoparticles, which cannot be captured using current technology.